Former Mount Cameroon striker, Valentine Atem, a.k.a Vallygoal who now plays for for Ashanti Goldfield of Ghana is prepared to take up Ghanaian nationality in order to play for the Black Stars. Atem, one of the top strikers in the Ghanaian league, believes he could solve the Black Stars goalscoring problems. "Ghana has been good to me and I want to give something back to this country," he told BBC Sport. Atem it should be recalled that two years ago when he joined the Ghanaian league was cornered by some top ranking soccer officials in Ghana to take up Ghanaian Nationality so that he could play for the Black stars, he took time to reflect and finally agrees. 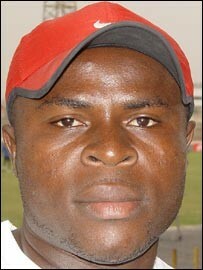 "After spending four years playing here, it will be good for my career and my family if I represent Ghana. "Ghana has a good side but the forward line is not that doing well. "At the Cup of Nations, they scored just two goals and when you look at the results from friendly games, it is clear that they have a problem in this area. "I don't know why but I believe that with my skills and the quality midfield players the national team has in Essien and Appiah, I can change things." While some people in Ghana's football community may think that Atem is seeking to take advantage of Ghana's World Cup qualification, he insists his desire is heartfelt. "If I get to play at the World Cup finals that will be fantastic but I am looking beyond that. "Ghana is always at the highest level in international football and the Nations Cup is coming up in 2008. "I will have many opportunities to show how good I am." Atem's request for Ghanaian citizenship is in marked contrast to the rising number of players that turned down Ghana to play for other countries. Zappos.com is proud to offer the Pony - Shooter '78 - High Crack Sde W (Rose/December Chocolate) - Women's: Take to the streets in this classic high top. Cracked suede upper for long durable wear. Lightly cushioned footbed provides walking comfort. Vulcanized construction. Rubber sole provides great all-day traction. Great for any casual occasion. You are quite correct you have no other option than join any other country you wish.No place for you with the Francophone Lions of Biya.I advice all Anglophones to follow suit than to think they can play with the Lions anymore. Atem Valentine, if that is what your desire is, go for it and make sure you do your best. This is the country in which we are living and some people still seek to vote for La republic, we have anglophone players but with the lot of discrimnation how did they get into the nationaly team that is only make up of francophones. Valentine is a good exmple, I wish him the best, boy take up that nationalitity and do your best overthere. Many of us are happy for you. I think Mokake will follow soon.WARNING TO POPO AND COHORTS. We got a very tight situation at the national team that gives little room for inventives. If we remember well, the coaching staff of the Indomitable Lions has always been patient with some body like Eto`o Fils and today he`s a superstar. A throwback at the 1998 worldcup tells all of this. Eto`o so young then, struggled at the worldcup to even touch a ball. When we started the eliminatories for the 2000 nations cup, he was no better still.A case in point is the Cameroon#Ghana match in Douala won by the Ghanaians 1#3. Though Eto`o came in as a substitute, his game was marked by a multitude of bad passes and uninspired dribbling. But then he was given the chance to improve. That is the same chance Atem Valentine didn`t have as a player in Cameroon. We have Eto`o and there is no need to think of a possible replacement.... This guy needed just that push to play a few times. It`ll be really sad to see him wear the Ghanaian jersey, as I was hoping he could still make it to the Cameroonian team. However if thats the road you`ve choosen, kudos man! I appreciate this guy for his gesture.Little doubt he has seen no hope with the Lions.I am still insisting that what Atem has done is nothing more than just a good example for others to copy....I personally was/is still a born footballer.But my experience in Cameroon was more than words can explain. I don't want to recall my experience in my years in Olympic of Mvolye with Mbarga Mboa(the present sports minister)as the president.I bet you if you are an anglophone you see descrimnation even within the clubs and players. The worst is during a match that concern the Cadet,Junior or senior Lions.They tell you straight that you are an anglophone so you need time to bribe before being selected even just for the preselection. Atem Valentine a.k.a Valleygoal,I wept after reading your intensions from the post to aquire a dual nationality so as to raise up the Ghanian national flag in the domain of football. Ma boy,we regret losing you but I most say go for it before is too late.I remembered some years behind where you were being honoured as the best player in the division (1)one site but I was surprised that the La Republique people can't use their iniciative to discover what is in you. Boy "I DON'T THINK THERE IS ANY PLACE FOR YOU IN THE LA REPUBLIQUE NATIONAL SQUAD".Sorry for shouting loud but I most say it.So you don't have to delay for the Real Madrid,Manchester,Chelsea,Milan AC etc.. are out there waiting for you.GO FOR IT and I wish you all the best in your football career. Vally, you know what!! Go for it baby. If your own country cannot recognize your talents, go where it will be recognized. After all why should you think twice to take up another nationality if it will help you? May be that is where your gold is. I wish you get selected for the world cup. So that some Good team in Europe can pick you up. Vally Ghana should not be your only dream, Please dream further than that. If they wish, they should fill all the teams with francophone players. After all, football in Cameroon is beginning to take a downward trend. It will take a lot of hard work, excellent coaches, and less discrimination to get the teams, and soccer as a whole back to what it use to be. They should stop living in past glories and get real. Valentine Atem, I strongly support your idea,If your country does not want to use you, some other country will.I saw you play in Cameroon, and you have always been such a terrific striker.Your combination with Esien in chelsea, who is one of the best midfielders in England, I think , you will deliver the goals for the Ghanian squad. Africans are playing good football in Europe today, and the quality of football has improved in Europe because of the professionals(ie people like you), You are one of those players who can create miracles, even at the last minute. You can build your career anywhere in the world. The race goes not only to the swift, but to those who keep on running. Make Ghana proud, they are still our brothers. I followed up Vally's interview in BBC, I was the in New York Park New York. I cried because I always knew Vally has a place in Football. Our grearest problem is that we have two country la republic and West Cameroon struggling to merch themslef. WE part of Bristish colony are still suffering, discrimination from la repulblic. The only stricker in the national team that can score goals like Vally is Eto'o but Valyy goal ha never been call, even when he was the best striker in cameroon( 2001-2003). vally go an represent the Ghanians, they are more our brothers than La republlic. We both think like an English man and speak English not like la repulblic and it corrupt frech culture. well vally i cant blame for for chosing to change ur nationality in other to pick the ghanian shirt, i support u, u are not growing any younger and if u keep on waiting for the cameroonian national team which belongs to the francophones then u are lost , my brother i am happy GOD has opened u the way , please go without looking back, good luck.